Sole F83 is an upgraded version of Sole F80, featuring a better display console and a stronger motor. However, if you are tight on cash and not planning to do more serious running, you might want to save some money by choosing F80, since the price difference is currently $200. Advanced 3-color LED display console with a message window, showing speed, incline, time, distance, calories, pulse and pace as well as 1/4 mile track and peak and valley graph for different programs. 6 preset, 2 customizable and 2 heart rate programs for a better workout. 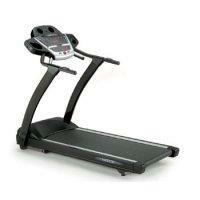 Do you have any experiences with Sole F83 or any other treadmill ? Help your fellow exercisers by writing a short review about your machine.